The most important feature of Mailing List Manager is its ease of use. Every function within the web based administrator operates with just a click of the mouse. It is a simple operation to add, edit, or delete email addresses within the system. Create stunning HTML mailings for a completely professional look and feel! If necessary, export your mailing list to an Excel-compatible format. Using simple HTML code, you can design a dazzling email to send to any or all of your mailing list. By combining graphic and text elements along with a custom background wallpaper, your mailing will stand out from the others. 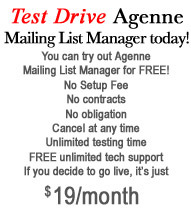 If you prefer to send plain text emails, Mailing List Manager can accommodate that as well. Simply enter the text that you wish to send, select the mailing list category (or categories or complete list) and send your message. Use our handy HTML code generator to automatically write the simple form that you will need to place on your web site for visitors to add their email addresses to your database. Assign email addresses within your list to any categories you wish to define. Email address categorization is automatic for addresses entered by visitors to your web site. If you are using CustomCart, when a customer completes an order, and opts in to your mailing list, their email address is added to your list and automatically categorized as someone who placed an order. In addition, when you are ready to send mailings, you may send to any or all categories on your list. This allows you to send specially targeted emails for enhanced customer relationship management. Mailing List Manager automatically integrates with our CustomCart commerce system and Registry Valet gift registry software to collect email addresses from customers if they so choose. By checking this checkbox and clicking the "Test Drive Now" button above, I affirm that I have read and agree to the Terms of Service.